Soya oil - hydrogenated, DL-alpha-tocopherol, disodium edetate, butylated hydroxyanisole, soya oil-(partly) hydrogenated, beeswax - yellow and vegetable oil - hydrogenated. Gelatin, glycerol, sorbitol solution 70% (non-crystallising), indigo carmine CI73015, brilliant scarlet 4R CI16255, titanium dioxide, water-purified. on my 5th day for this treatment, forehead and right cheeks breaking out. Lips not dry. Hope i’ll get through this. Skin started to clear within days. After 1 week 70% of my acne had deminished. After 2 weeks 90% of my acne has cleared. Dry lips. Feeling a little dehydrated. Expierenced sme die effects in the first few days (nausea, dizziness, general feeling of unwell). In the first week I experienced frequent urination and insomnia. I had HORRIBLE cystic acne and it never got worse whilst taking this product. 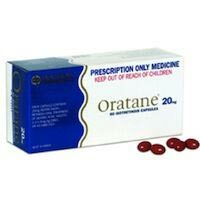 I take the 20mg Oratane as well as an antibiotic and a cortisone tablet. This medication has worked wonders for me and I strongly recommend it to anyone with difficult acne. It immediately started drying up skin and stopped new pimples appearing. No serious bad side effects. It works! Dry lips. For the first few weeks I had trouble with my sports (I run for a harrier club 6 times a week), but this wore away after about the 3rd week. Acne scars remain. Had to get prescribed by dermatologist, seeing the dermatologist cost a bit of money. It works, and although it doesn't remove scars, new pimples have stopped. No serious or long-lasting side effects. I've finished using it now after 6months on 20mg pills once a day and it has worked really well. Hopefully it works for you too!